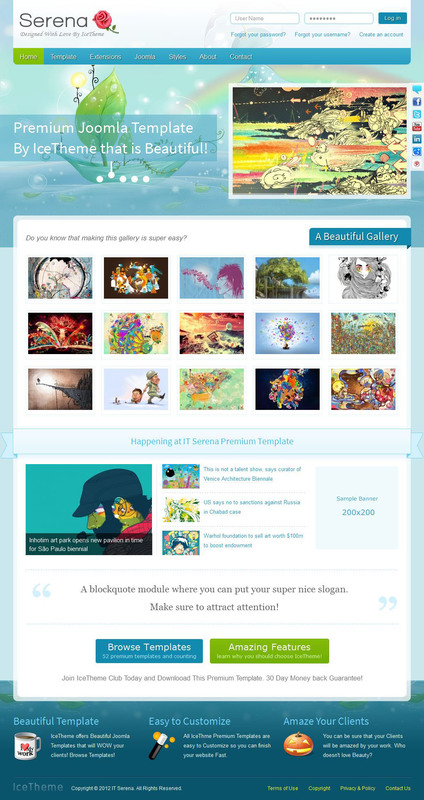 IT Serena - professional template for Joomla 2.5 from the team IceTheme. This template contains 4 unique colorful threads that give a bright and unique view of the site and can be used to create a personal blog or company website. Convenient manager template admin panel site provides full access to its basic parameters. In the assembly includes updated expansion of the studio, giving special template functionality and flexibility. Serena perfectly optimized, has a fast speed of loading pages, supports a variety of mobile platforms, as well as works correctly in all browsers.